It's been just about 48 hours since we released the full version of //TODO: today and we are honestly blown away by the positive response! 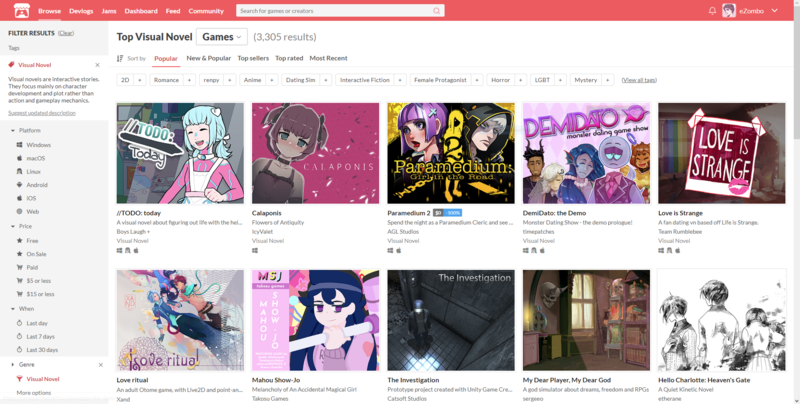 Since the update, it's been downloaded over 600 times and actually managed to stay at the top spot of the most popular visual novels on itch.io for most of that time! We really didn't expect this and are super grateful to all of you. Thank you so much for playing, for commenting, and for being so supportive! We really appreciate it! This devlog actually won't go into much detail about "development" this time but we figured now that //TODO: today is released, we should talk a little about our plans for the future. First off, we are working on a small update for //TODO that fixes some typos and bugs. We'll release that later this week, but there won't be any major content changes. Over the coming weeks we will also release another small update that adds some additional music to moments where it's currently missing but eerron is still cooking up those tracks. Around the time of that update, the soundtrack should also be released so if you liked it, there will definitely be a way to purchase it! Now that //TODO: today has been freshly released I wouldn't want to spoil ya'll by describing my work on the art assets in it. Instead I would like to let you in on something even fresher. We've mentioned it before and now that the major work on //TODO: today has been completed I'm tackling a new project on my own. Oh and don't worry it's not like Felix and I are going our separate ways from now on or anything. It's just for this project and maybe our time on divided projects will be a valuable experience as well. So, this yet untitled project will be a narrative experience for Android mobile devices. I'm mainly a 2D artist with some basic coding experience so this'll be a huge challenge. But it'll also be a nice change of pace. And I like to make use of the current freedom I have to make things I like. Apropos, Brassica is still on our list of things we need to continue, so I'll try to structure my time to make space for Brassica as well. But it's currently unclear how much of time I can invest in it. So yeah, for the rest of the year Rohan will be busy with his own project and won't be able to do much for BL+ during that time. Felix will finish writing Brassica and Rohan will try to complete the art assets along the way so we can release the remaining acts as soon as we can manage! The episodic nature of the game should help with that but it might still take some time. Once he finishes writing Brassica, Felix will also start doing some more preparations for Defaction. We recently decided to reevaluate parts of the story and concept simply because almost a year has passed since our initial phase of pre-production and because the scope currently seems a little too big for what we can handle as a two person team. We're still excited about the premise and the project so we definitely want to make it happen but we might have to cut or change a few things to do so. But yeah, figuring that out is one of the tasks for the coming months! Because of this split in work, our devlogs will probably also be posted less frequently. We still want to stay transparent about our development process but for now we will have to wait until we actually have something to write about. Oh yeah, and resting a bit is definitely on our agenda as well as soon as our schedules allow it. Well, and that's about it. While there might not be much new content in the near future, there will definitely be more releases from BL+ so we hope you're excited!